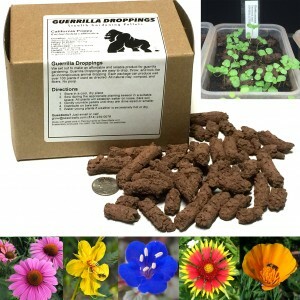 Our Guerrilla Droppings come in a wide variety of US native wildflowers. Guerrilla Droppings come from our team of expert seed ball makers (aka Mudslingers). We make thousands of seed balls every day, sold at Seed-Balls.com, and think a great deal about planting seeds. We recognized that however fun and exciting seed balls are to young and new gardeners, there is a lot of labor and time involved in making the seed balls uniform and round – important for marketability, but not so important to the seeds. This drives the cost up and offers no advantage to the plant. The higher price tag means less plants are grown, which is really our goal in the end. We set out to find a way for seriously green people to plant important species in suitable places quickly, efficiently, and inexpensively. After a few years of trying different techniques – and wow, did we find a lot of ways to make and manipulate mud – we’ve come up with a very affordable and effective recipe and process that works brilliantly for stealth gardening and conservation. We are also selling Guerrilla Droppings under a different label, Ground-CoverAlls, to appeal to the less-audacious conservation gardener. Give ’em a try. We’re sure you’ll recognize their green powers.